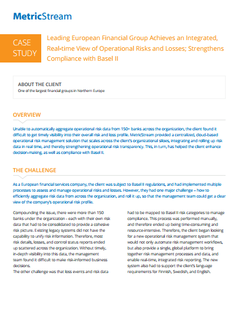 Unable to automatically aggregate operational risk data from 150+ banks across the organization, the client found it difficult to get timely visibility into their overall risk and loss profile. MetricStream provided a centralized, cloud-based operational risk management solution that scales across the client’s organizational silos, integrating and rolling up risk data in real time, and thereby strengthening operational risk transparency. This, in turn, has helped the client enhance decision-making, as well as compliance with Basel II.